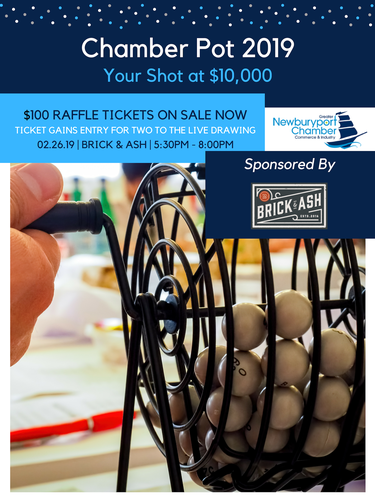 Tickets for the Greater Newburyport Chamber of Commerce annual raffle, Chamber Pot, are now on sale! 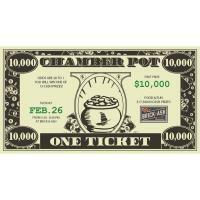 Tickets are $100 each, and the odds are great that you'll win one of 13 cash prizes. Gather your friends, family, and colleagues to split one or as many tickets as you'd like. Remember the odds are in your favor! Enjoy the evening while being served tasty food & beverage from Brick & Ash who is known for their elevated American comfort food in a brick & fireplace-filled setting with seasonal patio. The event will also include a 50/50 raffle and silent auction. You don't want to miss this. Over $17,500 in CASH prizes!